Strong, peppery, and robust arent words that youd traditionally use to describe a Macanudo cigar, but Cru Royale is not your typical Macanudo. These stronger-than-usual stogies are made with a spicy blend of Brazilian, Dominican, and Nicaraguan long fillers, along with specially-grown Dominican binders, and are finally topped off with dark and oily Ecuadorian Habano wrappers. Expect a complex, woody smoke with notes of coffee, cocoa, caramel, and pepper that will coat the palate beautifully. Macanudo Cru Royale Poco Gordo delivers its lush, layered flavor in a short, stout 4x60 vitola. Perfect for when you just want a short smoke. If you are in the mood for a robust flavor short stoye this is the one. I bought these on a whim and have no regrets. Good draw and nice aroma. I don't like to be puffing a cigar for more then an hour so its the perfect size. Great cigar, great draw and smoke. Would recommend to friends. Easy draw with every stick. Very pleasant. 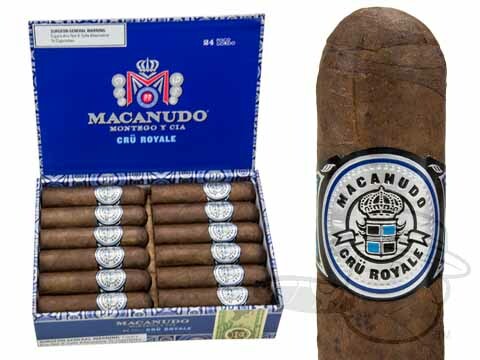 Macanudo Cru Royale Poco Gordo is rated 4.6 out of 5 based on 10 customer ratings.